As a massive star collapses into a black hole, it sends out a brilliant SOS signal in the form of ultrabright gamma-ray bursts. Now, scientists have found something very peculiar about those mysterious signals: They seem to reverse time. A new study, published Aug. 13 in The Astrophysical Journal, has found that these gamma-ray bursts are time-reversed, meaning the brilliant light wave is spit out one way and then sent out again in the opposite order. Gamma-ray bursts are some of the highest-energy explosions ever detected, shining brighter than a million trillion times the output of Earth’s sun, according to NASA. “Gamma-ray bursts are the most luminous sources known in nature. They produce more energy output than anything else that emits light,” said study lead author Jon Hakkila, an astrophysicist and associate dean of the Graduate School at the College of Charleston in South Carolina. When two neutron stars collide, they send out short gamma-ray bursts as they form a black hole. Supernovas, or star explosions, produce longer gamma-ray bursts as the dying stars collapse into black holes. For both types of gamma-ray bursts, “most of their energy comes in the form of pulses,” or blips, Hakkila said. When Hakkila took out the main, brightest pulse from the data to better see the rest of the light signal, he found that “the blip actually had some little side blips,” he said. Every pulse, the researchers found, had three distinct peaks where light increased and then decreased in intensity a few times over each pulse. As the scientists looked at the data, they happened to find that the structure of these peaks looked like reflections in a mirror — the parts of earlier pulses that came out first were coming out last on subsequent pulses. While looking at six of the brightest gamma-ray bursts detected by NASA’s Compton Gamma Ray Observatory as part of the Burst and Transient Source Experiment in the 1990s, the team found that the bursts contained time-reversed light signatures. In other words, “they all have this signature of brightness that fluctuates and then it turns around and goes backwards in time,” Hakkila said. This is true for both short-lived and long-lived gamma-ray bursts, Hakkila said. To better picture this, imagine if you turned on three light switches: A, then B, then C, and then always turned off C first, then B, then A, Hakkila said. To really see this, the researchers took the entire signal, stretched it and folded it right down the middle like a piece of paper. That “folding” process aligned the rise of the signal with the fall of the signal. The two ends lined up really well. “A gamma-ray burst represents the formation of a black hole, and there’s all sorts of very odd things that happen with both space and time and the relationship between space and time in the vicinity of a black hole,” Hakkila said. Though the blast is probably not “reversing time” with some radiation mechanism as it would in a science-fiction movie, “I’m not going to exclude any kind of weird thing,” he said. “I can only think of two ways to do that,” he added. Either the wave must hit some sort of reflective surface, similar to a mirror, which reflects the blast wave backward, or the clumps must be distributed in some bizarre way that makes no sense using ordinary physics. Understanding this process could shed light on how stars die, Hakkila added. However, not everyone is convinced that time reversal is the best explanation for the gamma-ray burst signals. “I appreciate the great efforts of the authors. However, the scaffold that the research is built on may be flawed,” said Bing Zhang, a professor of high-energy astrophysics at the University of Nevada, Las Vegas, who was not part of the study. 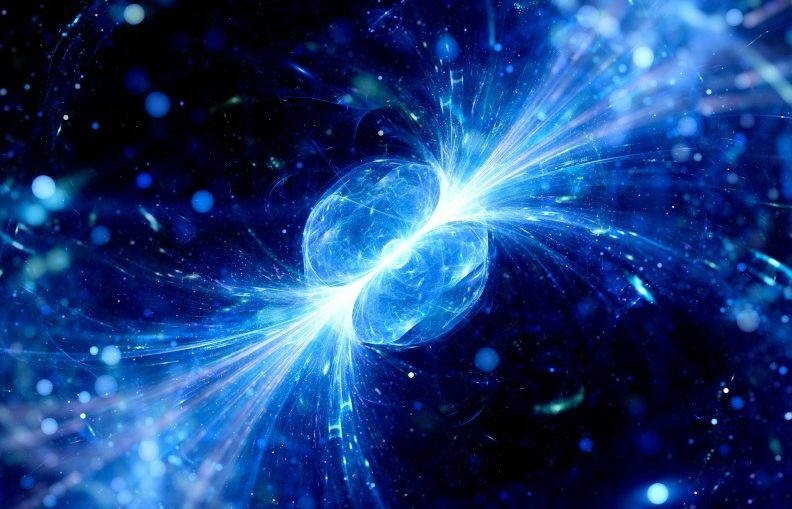 The finding of time-reversed structures is based on the assumption that each gamma-ray burst is “composed of several well-defined pulses,” each having a shape described by a mathematical equation. But the shape and nature of those pulses may be more complicated than the simple mathematical form, so that the triple-peak-pulse residual may not be physically real, he added. “Maybe the mirror hypothesis … is valid after all, but right now, the support to this hypothesis is rather indirect,” Zhang told Live Science. As always, the picture gets stranger the closer we venture to a black hole.